Sean, Chris, Nathan, Adam and Nicholas on the trail. During part of our visit, my sister, her husband and my two nephews (notice, not their sons – my nephews) joined us for a few days. 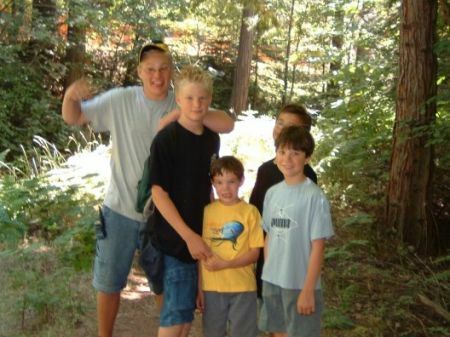 In the album below is a photo of the boys heading down a trail that leads along side the Lyons Canal in Twain Harte. We hiked for quite a while and never reached the end! I probably would have kept going, but Nathan had to take three strides for my one, and it was warmish. Then again, I think my sister was a bit apprehensive about the nearby shooting range. 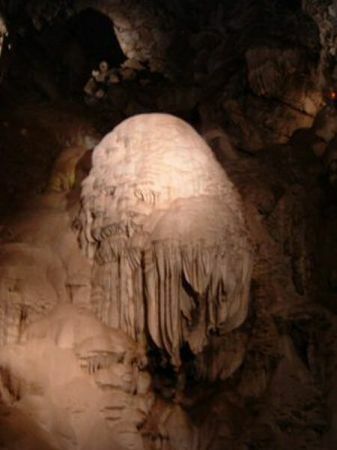 One way to escape the heat in Tuolumne County is to head underground, and there are three or four various caverns or mines within a hour’s drive or so. We headed for Moaning Cavern, just outside of Vallecito. The cavern was first discovered in approximately 1851 by miners prospecting for gold, but they didn’t have enough vision to understand tourists might offer up gold to see this natural wonder. It was rediscovered in 1919. Legend says tourists were lowered into the huge chamber in ore buckets with only the light of candles. The cavern got its name from the sound created by drops of water that fall into holes in a flowstone formation with a bottle-like shape. This drumming sound echoes throughout the cavern, and sounded like a distant moaning to early explorers. 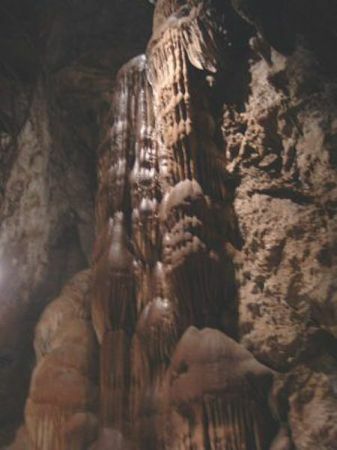 In the cavern one can find stalactites, stalagmites, draperies and dripstones. Large enough to contain the Statue of Liberty. 234 stairs descend to a depth of 165 feet below ground level. Above-mentioned stairs were built from salvaged materials from a World War 1 battleship and was built in six months. Bones of prehistoric people who had fallen into the cavern thousands of years ago were found on the cavern floors. The cavern’s current total depth is 410 feet. Other formations in the cavern include the “Chocolate Waterfall,” “The Meat Grinder,” “The Lasagna Factory” and “The Fruit and Vegetable Market.” Seems the early cave explorers were a bit hungry. The oddest name for a formation is probably “Godzilla’s Nostril;” though one can see it after staring for a bit. One of the things we enjoy quite a bit while at the cabin is nearby fishing. The same irrigation ditch I mentioned earlier is also stocked with pan-sized rainbow trout (about 11-12 inches and ½-¾ pound). About a year ago we took my nephews there and lucked upon newly stocked fish, and they had a blast. Between five of us we must have pulled in 15 or so fish! Well, figuring lighting might strike twice, Chris and I took our friends’ son to the same spot. Sure enough he hooked into a very decent size fish with a decidedly undersized pole. It was so very cool to help him reel in that first fish. And I hear that his mother enjoyed it for lunch shortly thereafter! In between all of the above, we went swimming almost daily, hit the annual barbecue dinner at the lake on the fifth of July, visited Covers’ Apple Farm, enjoyed miniature golf, bowled (to get out of the heat) and generally just spent time as it should be when on vacation! The “Brain” in Moaning Caverns. Chocolate Waterfall in Moaning Cavern. Categories: Fly Fishing, Twain Harte, Uncategorized, Vacation & Travel | Permalink.